DIY Christmas gifts may be a good idea in the last minute giveaway fever. Have you forgotten someone, or just did not have time to buy a gift for everyone? There is always something nice to create from the things you can find at home in your larder or on the bottom of the utensil box. You can use almost any materials. Just let your fantasy do its job. Giving handmade gifts this Christmas has a lot of benefits. Besides saving money you are making something very personal. Using recycled materials and creating something new from them is a great solution. You can whip them up in no time. Even if you are new in the world of DIY crafting, these ideas might be helpful for you. Believe me, you will truly enjoy making them. Candles belong to long Winter evening. They can bring a magical and relaxing atmosphere into your home, and they can always serve as a perfect gift. For some festive candle holders you really do not need to many things. 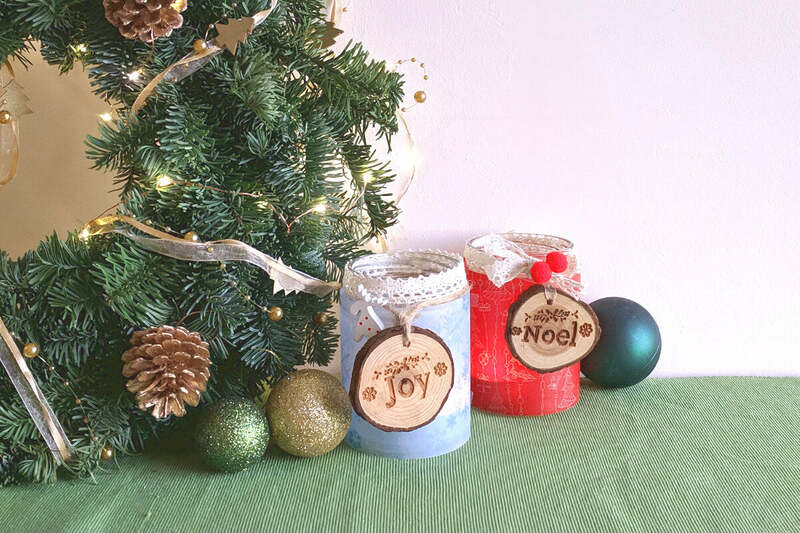 I used simple jam jars, christmas patterned transparent papers, cello tape, some ribbons and decorations I found in the bottom of my creative drawer. Wrap around a clean jar (or glass) with transparent papers (cut on size) and fix it with a cello tape. Apply the ribbon, or more ribbons of your choice.Add some other decorations to the composition like small wooden figurines, dried orange slice, etc. 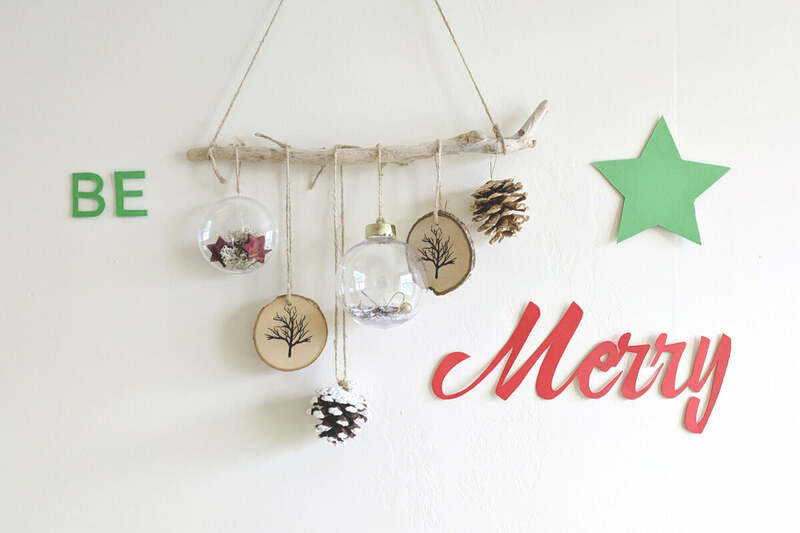 Gift a festive backdrop for your friend or family with wall decorations made of paper. You would not think, but it will be the most photographed background wall during Christmas. What you need is a computer, printer, card stock paper in different colours, scissors or paper knife and double sided stickers. 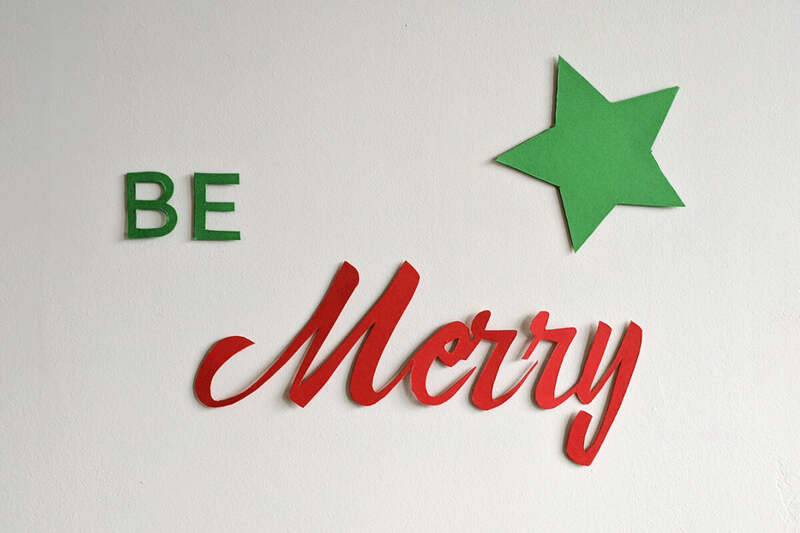 Make a decision about the text: “Be Merry” was my choice but you can chose other quotes, like “Hope - Joy - Love” or “Baby it’s cold outside”, etc. Find out how big the letters should be and print them out. Cut the printed letters and use them as templates. Place the letters onto the stock paper, draw them around and cut them out with scissors or paper knife. As an alternative solution: you can print the text directly to the stock paper (if it fits into your printer) and just simply cut it out. You can fix the letters or text with double sided stickers on the wall. Christmas is not as long and if you want to capture and keep its feeling for a bit longer you can make something which captures the spirit of winter. I love taking things home from my walks, like driftwood and pebbles from the beach or cones and branches from the wood. Exhibiting them in small arrangements somewhere on the window seal, in a basket on the dresser or on a small plate on the kitchen table or as a hanging decoration on the balcony. For this one I chose driftwood, white and gold painted cones, round shaped wooden coasters with tree decoration, garden string, felted stars and empty glass globes (you can get them in DIY shops as Christmas tree decorations). 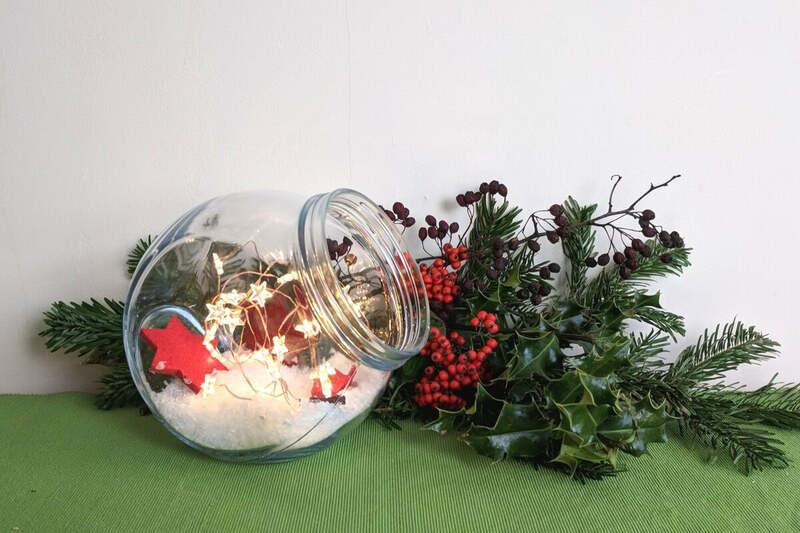 Fill the glass globes with the decoration of your choice. I used small felted stars, faux snow and other tiny things. Drill a hole into each coaster. 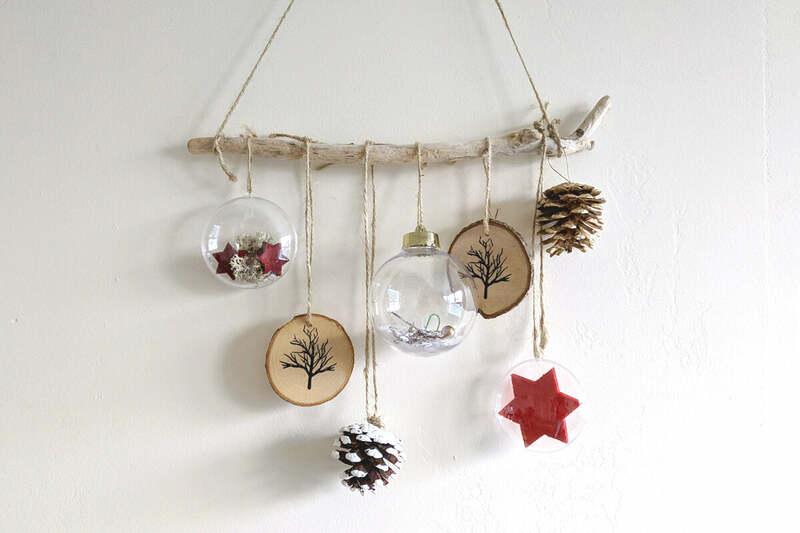 String the globes, coasters and cones onto the driftwood. There is nothing more cosy than curling up on a sofa with a cuppa and listening to some music at candlelight. But why not making it a bit more christmassy? You would never think how easy it is to prepare a bespoke homemade decoration with fairy lights. You just need to open the long forgotten Christmas decorations box to find some suitable lights and other components. Pick a glass bowl or a huge jar and some artificial snow. Place the switch of the lights (already fitted with working batteries) onto the bottom of the glass bowl. Fill the bowl with artificial snow up to a level to cover the switch. Arrange the lights to fill in the space and add some tiny christmassy objects, like the red stars on the illustration or some figures, to design the scene. If you want to gift something special, a box-frame can be a great solution. With a bit of imagination you can create a personalised picture, which can be redesigned from time to time according to season or mood. 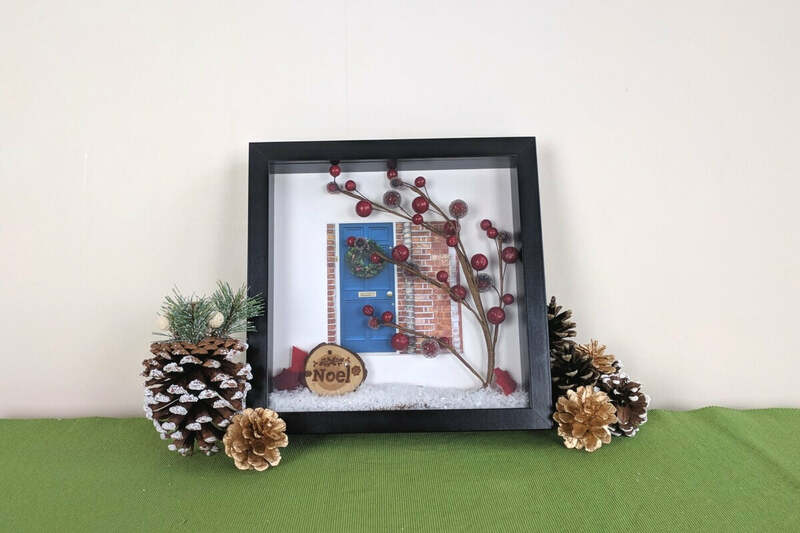 For a wintery scenery pick a box-frame, some small christmassy objects and a photo. Start by trying different ways to combine and connect the decorations. When you have found the best variation for your settings, remove the back cover of the box-frame and start to install the objects in the way you think is the most aesthetic. If you are ready and satisfied with the arrangement, place the paper mold and the photo on top of it and fix the protecting cover to the back. 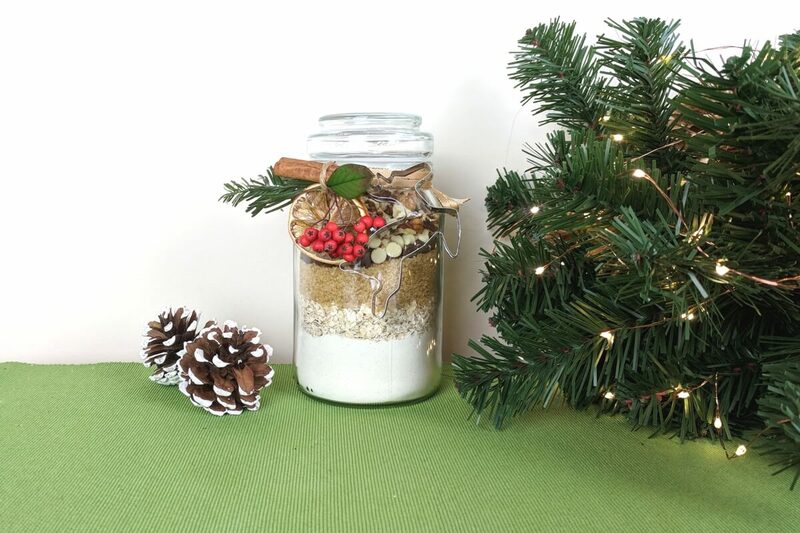 This gift is super easy and super inexpensive to make. You just need to open up the door of your cupboard or your larder and chose from the ingredients you find: flower, oat, brown sugar, chocolate drops, dried fruits or nuts. Use a jar with a sealing lid, something to measure with and a spoon. I followed a general recipe found online, which advised using a cup to measure the ingredients, so I just poured these into an empty instant coffee jar layer upon layer. The final decoration is entirely up to you. It is nice to tie biscuit cutter or something else with a ribbon onto the outside of the jar as a finishing touch. Don't forget, Christmas is first and foremost about getting together with your loved ones and enjoy the time together. It doesn't matter how valuable your gift is, what counts is the intention. Give some love to receive some love. Enjoy Christmas!